The National Society Daughters of the American Revolution, (NSDAR or DAR), was founded in 1890 to promote historic preservation, education, and patriotism. Its members are descended from the patriots who won American independence during the Revolutionary War. Since that day, more than 900,000 women have joined, representing chapters in fifty states and many countries around the world. 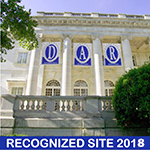 With 185,000 members in 3,000 chapters worldwide, DAR is one of the worlds’ largest and most active service organizations. DAR members are committed to volunteer service having served more than 12.5 million hours in communities throughout the world during the past three years. Narcissa Whitman Chapter NSDAR, was organized in 1909 by twenty-one charter members with the express purpose of honoring our Revolutionary War ancestors. Remembering our past and preparing for the future through organized service in our community to promote historic preservation, education, and patriotism are the objectives of the National Society and our chapter. Today we number approximately 80 members. Our friendly Daughters are vibrant, dedicated, and active in serving the goals of DAR. We support many projects and activities for veterans, active duty soldiers and their families, and our schools and communities. We encourage you to learn more about the Narcissa Whitman Chapter NSDAR and how we connect to our communities in Yakima County. Our members are a diverse group who are all direct descendants of Revolutionary War patriots and are bound together with pride in our inheritance and our love of country. We are a group of ladies of all ages, with varied backgrounds, talents and professional experiences in many fields, each of whom is respected and valued as a member. Many of our Daughters are volunteer genealogists and they can assist you with proving your lineage. We are inspired by the deeds and dreams of our ancestors and value the contribution that each of our members make. There is something for everyone to do! We all share a great heritage. Times have changed and so have we in DAR. Coming together is beginning, staying together is progress, and working together is success! Please contact our chapter's regent.